So I just read this great article in the Ensign called Peaches, Pruning, and Spiritual Progress. Its a story about a guy who planted some peach trees, and against all advice, was determined NOT to prune branches or peaches and have a huge harvest of peaches. Then a windstorm blew through and the weighted down branches snapped off causing a dominoe effect that snapped other branches etc till there was a carnage of peaches and branches everywhere. If only he had pruned the tree to give it strength to weather the storm. The point of the article was pruning out some of the fruit-bearing branches in our life so we can weather our own storms. It was a good article. We get so busy with "stuff", most of which is probably "fruit-bearing" and good. But you CAN get too much of it, and it all comes crashing down when the storm comes. 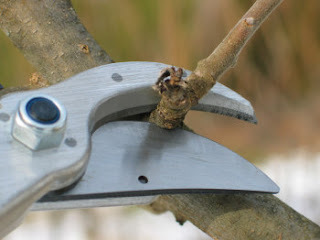 The trick to pruning a tree is knowing when its ok to prune the branches, even some of the ones that are bearing fruit. I drive past the new Gold's Gym twice a day to/from work. Its always full, and I wonder first, why the heck I dont have a membership there, and second, where do all these people get the time to work out? I generally get up for work at 6:00am and get home about 6:30pm. That gives me just enough time to have a family dinner, read a story with my kids, feed the baby, tidy up the house, make sure Crystal does her homework, get all the kids pajamas on, get them to brush their teeth and say their prayers, attempt some failure of scripture reading, do the dishes from dinner, tell my kids a bedtime story, deal with them getting out of bed, solve any remaining work issues, and somehow verify to my wife that I know she exists. (a side-note to all this is how much of all that Amy actually does and how uninvolved I can get, but thats an entirely other blog). Mondays is FHE (aka Failed Home Evening), Tuesday is Gymnastics, Wednesday is Piano Lessons and Bishopric Meeting, and we both attempt Home Teaching once a month and prepare whatever lessons we need to for our callings, and we have to squeeze in grocery shopping once a week at a minimum. Assuming nothing ever goes wrong, assuming there is never an issue with our cars, our plumbing, assuming it never snows, assuming our kids are never sick, or our pets, assuming everything in the whole freaking universe is in order, then we have just enough time to accomplish nothing. During this non-existance of time, I squeeze in some CSI/Lost or a computer game, all of which my wife does with me, so AT LEAST that works out. So when am I going to go to the gym? Why on earth would I want to add that to my list of crap to accomplish? WHERE DO ALL THESE PEOPLE FIND THE TIME TO GO TO THE GYM? The one blessing in all this, is mine and Amy's lives are so chaotic and busy, we dont really have time to do anything stupid AND we are learning what really is important and how to fit it in and what isnt important and how to prune it out. Its amazing how fast you gain knowledge when you have no choice but to learn it. Weve also learned the consequences when you put too much time into what you enjoy and let that which is important fall behind. Actually, we are still working on that, and probably will be forever. I like my orchard of "trees" just the way they are, which is growing in just the right direction and bearing just the right fruit. I feel they can withstand the storms that may come. Mark, I LOVED this post. Thank you for sharing. Very good food for thought..... or peaches for thought.